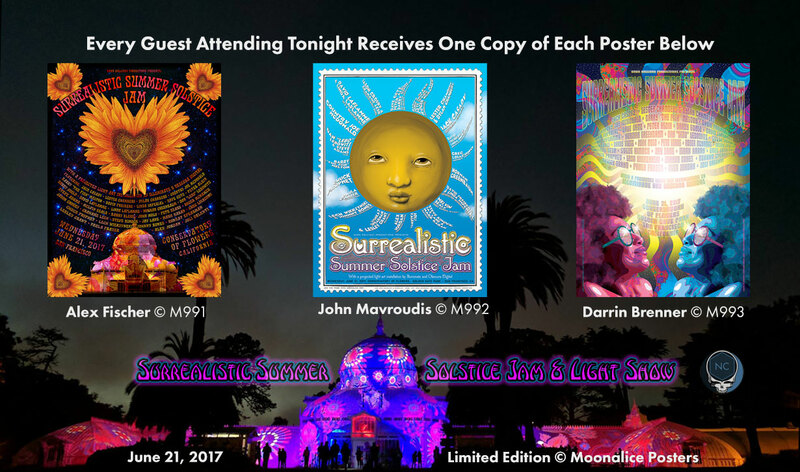 The Surrealistic Summer Solstice Jam will combine the Music of 1967 directed by Dan “Lebo” Lebowitz with a projected light art installation by Illuminate and Obscura Digital on the San Francisco Conservatory of Flowers! Music starts at 6:00pm Featuring: Jack Casady, Lester Chambers, Dylan Chambers, Country Joe McDonald, Barry “The Fish” Melton, David Freiberg, Linda Imperial, Dave Getz, Peter Albin, Darby Gould, David LaFlamme, Linda LaFlamme, Norman Greenbaum, Dan “Lebo” Lebowitz, Steve Adams, Melvin Seals, Barry Sless, John Molo, Pete Sears, Roger McNamee, Jason Crosby, Grahame Lesh, Steve Kimock, Jay Lane, Mark Karan, Greg Loiacono, Chuck Prophet, Lech Wierzynski, Johnny Bones, RonKat Spearman, Lesley Grant, Paula Frazer, Alex Jordan, & Joli Valenti! ? Grand lighting will begin at approximately 9:15pm. ?? Bring the whole family to this FREE, kid friendly event! ? A variety of food trucks from Off the Grid will be available if you get the munchies. ? ? The Conservatory is encouraging attendees to wear tie-dye to evoke the late 60s! ? ? No ticket is needed, but making reservations are strongly encouraged HERE. ? Three special Moonalice Posters, (pictured below) designed by artists Alexandra Fischer, John Mavroudis, and Darrin Brenner, will be handed out after this event. Please, be mindful and take only one copy of each poster so there are enough for everyone. Thank you. ?? EVENT INFO ANNOUNCEMENT ?? Really looking forward to attending this one!